Jewish Humor Central: Welcoming Shabbat with Yonina Singing Lecha Dodi to "All of Me"
Welcoming Shabbat with Yonina Singing Lecha Dodi to "All of Me"
Yoni and Nina Tokayer are a married musical duo with a little baby girl. 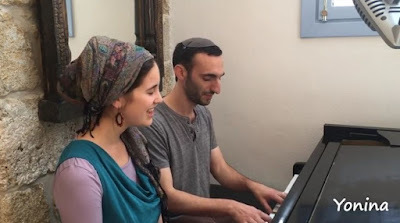 They're both involved in music and education, and live in the small town of Pardes Chana, Israel. For the past half a year, they have been uploading home videos to Facebook and Youtube and reaching millions. They have both been singing and writing since they can remember, and have been making music together ever since they met. The name Yonina is a combination of both their first names, Yoni and Nina. In this video, they sing the beginning of Lecha Dodi, one of the traditional parts of the Kabbalat Shabbat service. The melody, however, is not traditional. It's set to the music of John Legend's hit All of Me, a song that has an incredible more than a billion hits on YouTube, so you must have heard it somewhere before. Nope never heard John Legend's All Of Me. When I see All Of Me I think of the classic that starts "All of me why not take all of me. Can't you see I'm no good without you"
I updated the post to include a link to the original song. Click on the underlined title All of Me to see it. I'm with you Larry, I guess we're of a "certain age"